Hello sunny lacemakers and friends of the New School of Lace! ​Warm summer days are finally here, so let’s make use of long days and the abundance of natural light and make some beautiful lace! But, before the holiday starts, let’s reflect on the New School of Lace third school year in Ocean Park: 9 intensive workshops, 100+ regular weekly classes, 5 public demonstrations, 3 lectures, 1 Wire Lace Manual, 3 Pattern and Tutorial publications, 1 International Event, and thousands of hours dedicated to the art and craft of handmade lace… Thank you all, who participated and made the events so enjoyable, fun and very rewarding. It is your success – through your work, fine craft of handmade has become richer and livelier. Together, we truly kept lace alive for another year, and years to come… Great work, A+ for everybody!!! We have learned a lot, and all new skills should serve us well on our upcoming summer lace adventure. Celebrate our young country’s small but vibrant lacemaking community! Connect with your lace friends accross the land and share your Canadian lace theme patterns and ideas. Subscribe to the Canadian Lacemaker Gazette to support our dedicated lacemaking magazine, and its current editor Jocelyn Froese. Visit the new Canadian Lacemaker Gazette website to find out about Canada Project 150!, get your special edition Canada Pin and do not forget to register in the Canada Registry of Lacemakers! July is a lacemaking pillow month! Join us for a workshop with a truly summer theme and learn how to preserve a delicate hummingbird flight in a delicate lace form. Make the Hummingbird pendants for your friends to share and spread your love for the craft of lace. We are trying to reach the most lacemakers possible, so please share the info with all your lace friends. 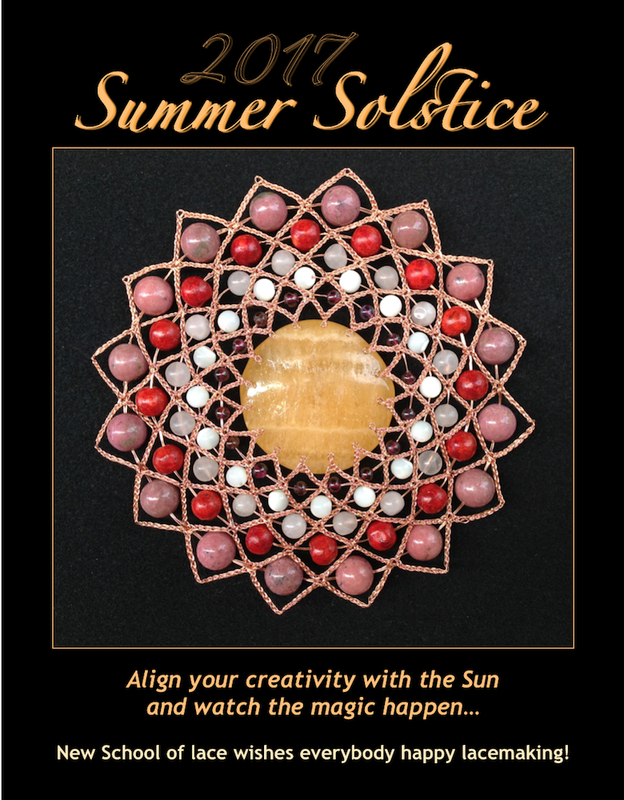 And most of all, please find time to participate in the challenge and make your lace|heart|art! The pattern is not complicated, so it should be possible to work even by beginners, yet it leaves enough space for experienced lacemakers to show off their technical and design skills! Get inspired and create you lace art in the shape of your heart! I will be making lace, showing lace art and promoting the New School of Lace in White Rock on nice sunny days. Artist Walk is a popular summer event for tourists as well as local art patrons, with fine art displays set up next to the White Rock Museum Plaza and alongside the west promenade. As many of you know, White Rock beach is quite beautiful and in summer time, the ocean view there is the best backdrop for any creative work 🙂 If you want to meet me there, and perhaps to bring your lace pillow along, let me know! This year again, thanks to a talented lacemaker, fantastic artist and respected art organizer, Marina SzijARTo, and thanks to two most dedicated students, Angela Kikuchi and Donna Leong, the New School of Lace will be represented at the Richmond Maritime Festival on August 12-13. Stop by to say Hi! and enjoy the lace demos, displays, original lace jewellery sale, and all other activities and entertainment at this hugely popular festival in the historical Britannia Shipyards. There will be no workshop in August, but we should work on the Bookmark Project, to have some samples ready for Back to School. If you are interested in participating, please let me know and I will keep you posted. Have a great summer and make sure to fill it with lace! ONGOING CLASSES IN FIBRE AND WIRE LACE are continuing in my studio through summer months and there is always space for more lace instruction. New School of Lace also offers customized instruction for groups and individuals, in all techniques (wire and fibre) and design. Feel free to contact me to discuss your ideas; I will be happy to accommodate your requirements by setting up a class or workshop just for your needs. 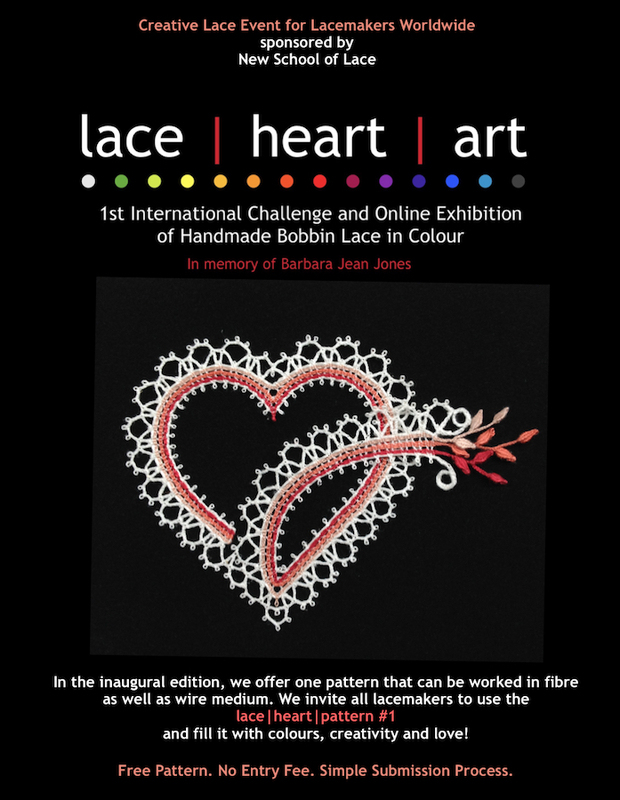 New School of Lace is pleased to announce a launch of the ‘lace | heart | art’ – 1st international challenge and online exhibition of handmade bobbin lace in colour. Our new project offers one simple heart pattern and invites lacemakers around the world to fill it with colours and love. We welcome everybody, and especially young lacemakers, to participate, get inspired and transform our first heart pattern into original lace art. In the inaugural edition, we offer one pattern that can be worked in fibre as well as wire medium. Our lace|heart|art pattern #1 is open to interpretation, and lacemakers are encouraged to fill the given pattern with colours of their choice. The heart design is open ended, and the trail can be finished in many imaginative ways. The pattern, and the whole challenge, follows the New School of Lace principles of respecting the tradition and encouraging creativity in the field of handmade lace. Learn more about the ‘lace|heart|art challenge’ and share the news with your lace friends!